Bulls hitters continued their remarkable run yesterday afternoon with 10 more hits (helped out by 5 walks and 2 HBPs) resulting in 6 runs. Chris Carter kept going with his outstanding performance going 3 for 5 with 2 doubles and 2 RBI (18 on the year). As a team, the Bulls’ wOBA has grown from .313 to .331 in just four games. 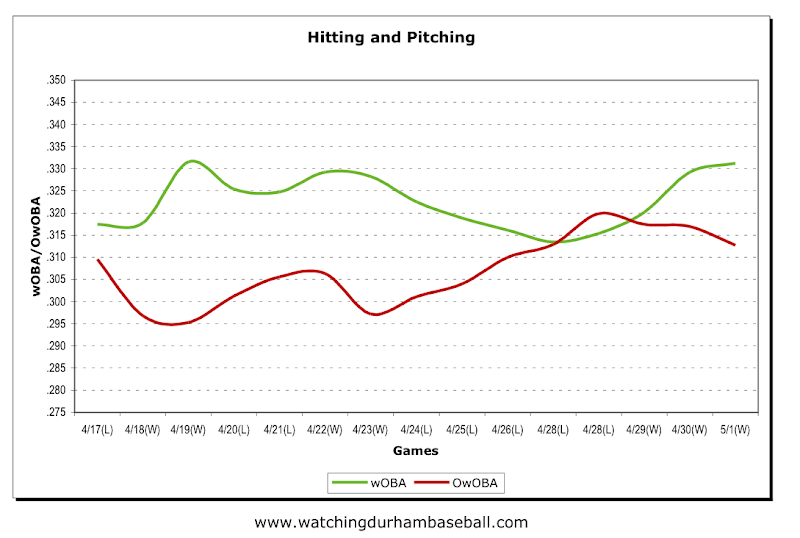 The “Hitting and Pitching” chart provided just a couple of days ago has seen a dramatic change. 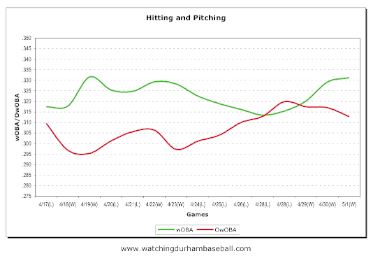 Nice to see green (hitting) going up and red (pitching) going down. Speaking of red going down, Alex Torres had another good, if erratic start. He’ll settle down someday, I’m sure. But his propensity to give up a string of walks adds discouraging excitement to a game. Happy to see Chris Bootcheck back on the mound. I’m guessing that his long stay on the disabled list reflects the change in thinking about concussions in all of sports. Not long ago if you could correctly count the fingers a coach was waving in front of you it meant you were OK. Now head injuries are treated much more seriously. As mentioned, just a guess, but Chris was out for more than two weeks. Newcomer Ryan Reid had a clean inning. Down in St. Petersburg Alex Cobb did a decent job in his major league debut, even if he didn’t seem to be happy with himself and he may have been tipping his pitches. I guessing he'll be back on the mound in Durham later this week. Also, local (i.e., St. Pete and Tampa) papers are reporting that the Bulls Brandon Gomes has been called up; however we’ve seen nothing official from the Bulls. Reminder: Tomorrow’s 11:05 AM game will be broadcast on the MLB network. Set your DVR or, what the heck, take the day off and stay home to watch the Bulls in Indianapolis. Pitching prospect Matt Bush had a good day.